Seventy percent of the global population is suffering from at least one chronic disease, and the percentage is even higher if you live in the Western world. Every day you hear about some new miracle pill or procedure that claims to make you younger, stronger, thinner, more beautiful and heal you from some chronic disease. From the fountain of youth to the quest for the holy grail for eternal life, people seek ways to age slower, live longer, and be healthier and happier. However, what many fail to see is that the secret to all they seek has been within their reach all along. In fact, the only one controlling how young you feel, the state of your health, and your level of happiness is yourself. We all have access to the secrets of lasting health all along. So why don’t we all just follow them? Stress doesn’t just affect you emotionally, but physically. Left unchecked, it can lead to heart disease, obesity, diabetes, high blood pressure and hormonal problems. The stress from anxiety can make you feel genuinely sick. Make good food choices. Eat foods that were meant for humans. No matter how much confusing articles there are out there, there is only one diet that is suitable for our species. And once you follow this diet, you will feel, look and think much better because our diet affects every aspect of our being, from the expression of our genes (determining which diseases we will suffer from) to the length of our telomeres (determining how long we will live and how long we will remain in a healthy condition). Now once you know which foods should star on your menu make sure you steer clear of anything processed. Load up on whole fruits, vegetables, nuts, and seeds as well as legumes and grains that the human body was designed to consume. When eating junk food, added sugars, and food filled with chemicals or GMO’s, you’re introducing substances into your body that the body wasn’t naturally designed to consume and deal with. In small amounts, the body will surely cope, but if this is the food you consume daily, then your body will have a more difficult time attending to your health. Eat foods that are good for you, good for your gut microbiome and that strengthen your immune system. Water influences all the processes in your entire body. The human body needs external sources of hydration to meet its needs, unlike some other species which get all of their hydration needs from their diet. We have no hair on our body so as to allow us to sweat off excess heat which is helpful for us in hot weather conditions, but these fluids must be replaced. Water also helps you dissolve fat and soluble fiber; it lowers the incident for bladder cancer and keeps your bodily excretions regular. Drink 6 to 8 glasses of water each day to stay sufficiently hydrated. The formula to calculate the amount of cups you need to drink daily is: your body weight X 0.14. This will give you the number of cups you need to drink per day. It’s not enough to get the right amount of sleep; you need quality sleep. Sleep helps restore your energy and repair muscle tissue. It’s essential for proper brain function, learning, and memory retention. Without sufficient sleep, your mood dips, you lose self control, and you have difficulty concentrating and paying attention. All of these conditions lower the quality of your health, relationships, productivity and your life. Sunshine offers Vitamin D which your body requires for almost every organ and function of our body, because vitamin D is not really a vitamin but rather a hormone (I go into this more in this article I wrote: The Ultimate Guide To Vitamin D). Vitamin D influences the expression of genes. It is needed for all cell renewal and protein transcription due to its role in allowing access to the DNA of the cell and allowing the cells to get the information required for protein production. Vitamin D was part of our lives throughout most of our history, living on the savanna grasslands of Africa until many of our ancestors migrated out of Africa around 60,000 years ago. Previously we had sufficient and regular exposure of our skin to sun allowing our body to produce adequate vitamin D through a precursor to the vitamin that goes through a process in the liver and kidneys to produce vitamin D for use by the body. But now we are spending long hours in regulated environments at home or in the office preventing us from getting a sufficient regular dose of Vitamin D.
We have also moved north or south from the equator preventing us from getting sufficient sunlight during a whole season (winter), requiring most of the human population to supplement with Vitamin D not to suffer the consequences. Your body and mind are connected. Chronic negativity, a judgmental attitude, and prolonged stress can compromise your immune system. Studies have shown that those with a positive attitude are less likely to become sick or stressed and are more likely to live longer happier lives. The more positive your outlook, the more satisfied you are with life. Life satisfaction and positivity ultimately lead to mastering your mind rather than having your mind master you. Once you learn to master your mind to choose a better attitude, you will also be making better decisions when it comes to your well-being and lifestyle, significantly improving the quality of your life. Exercise also influences every organ of our body. It makes us more relaxed, more productive and even smarter. To get sufficient exercise, if you believe it is not your thing, all you have to do is walk more or swim. 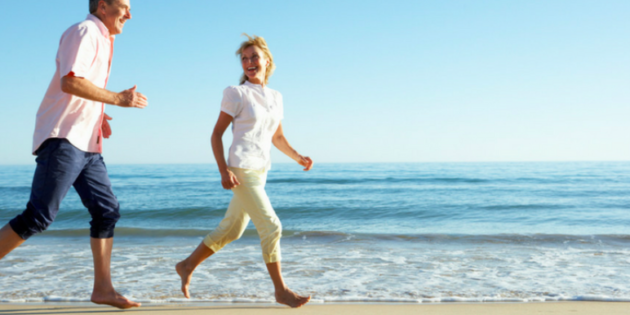 Add 30 minutes of walking or swimming to your daily schedule. It’s easy and very doable. If you just watch a little less television and take half an hour break from sitting on your sofa a day, you will definitely have incorporated physical activity into your lifestyle. Now I know you that you all know these keys very well. So what’s stopping you from regularly incorporating them in your life? If you think something is holding you back, please check my short book series titled “Rejoice Every Choice.” You will undoubtedly learn what’s holding you back and gain all the tools to thrust you forwards in achieving all of your life goals. Thank you for taking the time to read this. I’d be honored if you would share it with your family, friends, and followers by clicking the Like, Tweet, and Share buttons. If you are not already on my mailing list where you will receive my weekly articles packed with scientifically based health, and nutrition content, as well as many FREE bonuses and special offers, and much more, then click HERE to subscribe. Neurol Sci. 2017 Mar;38(3):451-458. doi: 10.1007/s10072-016-2790-8. Epub 2016 Dec 19.